I read a lot of parenting books as well. To gain more knowledge on their development. We all know that when a child is born, a mother is born too. My huge family has always been there for me at any given time, but this is for my own learning. I wanted to do every little thing on my own self. My kids, their days, months, years, their growth, their brain development, and etc. These books have helped me a lot in my kids development. 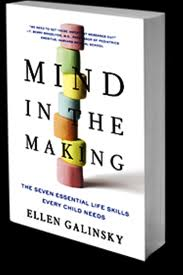 One such book is, "Mind in the Making: The Seven Essential Life Skills Every Child Needs by Ellen Galinksy." What life skills do all children need to succeed in life? Ellen Galinksy has spent her life researching and understanding child development. In this book, she pulls together this research showing why these skills are important and how you can help your children develop these abilities. She provides plenty of research and ideas for building these skills in children. Her suggestions allow you to have fun with your kids while growing their minds! Every mother should read this book once. Give it a go ! !